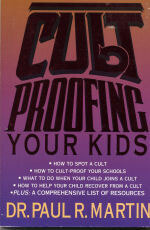 Books | Cult Proofing Your Kids | Watchman Fellowship, Inc. The first comprehensive psychological, social, and evangelical treatment of the growing and insidious cult problem. Martin provides evidence that our schools, families, and even our churches have facilitated the rise of cults and offers suggestions on how these institutions can develop cult education programs and assist in the healing of former members.